US Steel shares are tumbling on Thursday, down 9% after the company’s guidance for third-quarter earnings missed Wall Street’s expectations. Kevin Bradley, the chief financial officer, told analysts on the earnings call that the company expects third-quarter earnings before interest, taxes, depreciation and amortization (EBITDA) of $US525 million. That was lower than the $US589.8 million that analysts surveyed by Bloomberg expected. The steelmaker reported second-quarter earnings on Wednesday that topped analysts’ expectations, and raised its full-year forecast for adjusted EBITDA to a range of $US1.85 billion to $US1.9 billion, up from $US1.7 billion to $US1.8 billion. This initially lifted the stock by as much as 6% in after-hours trading. “The success to date of our ongoing $US2 billion asset revitalization program, as well as our earnings power in thecurrent market, makes us increasingly optimistic about future investments that will drive long-term profitable growth,” David Burritt, US Steel’s CEO, said in the earnings release. US Steel’s stock is down 7% this year. 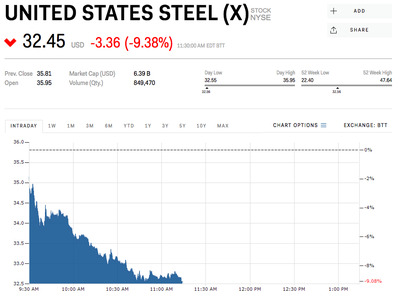 It had spiked right after several announcements from the Trump administration on steel tariffs, which are intended to boost the domestic steel industry.